HAMILTON — High school seniors across the Tri-State are in the midst of a life-changing decision this time of year: Where to go to college. For students who decide college is the right next step for them, plenty of factors come into play, with one of the biggest being cost. Hamilton High School works to provide a solution to this, through a program partnering the high school with Sinclair Community College. Some students are even set to graduate in the Spring with more than a year's worth of college credit under their belt, which saves students plenty of time and money. "It's amazing," said Morgan Mayer, senior at Hamilton High School. "I've definitely worked hard all of high school to make sure I was in this position." Mayer plans to attend The Ohio State University, with aims to become a speech therapist. Thanks to the program at Hamilton High, she's already off to a big head start. When she graduates high school in May, Mayer will depart with 46 college credits, amounting to a year and a half of college already conquered. "It's honestly like a huge sigh of relief because it's definitely nice knowing I'm going in as a sophomore with possibly part of my sophomore year finished," she said. "It's nice knowing I don't have to pay for that or worry for that." 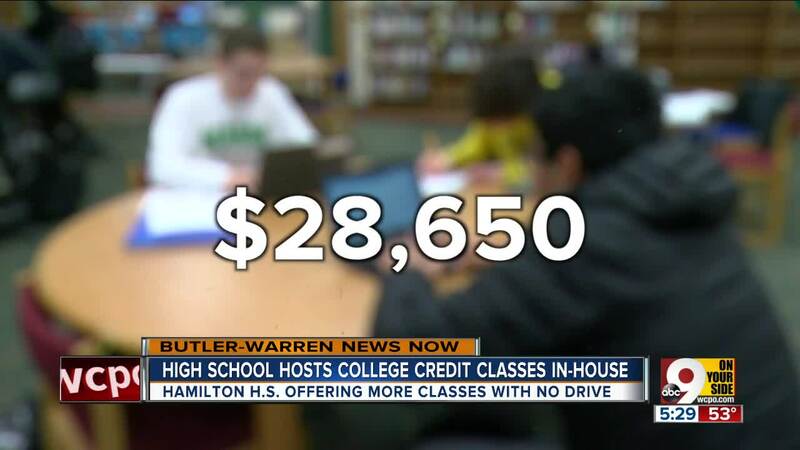 Mayer is one of about 200 students who have benefited from College Credit Plus at Hamilton City Schools. The district works with Sinclair Community College for the post-secondary courses. "It's helped me grow as a person, and helped me realize who I am and what I want to become," said Mayer. The program is in its fourth year since its inception, but the school said it's made a lot of changes in the last two years to make it even better. "When we changed our model, we wanted these classes on-site so students who did not have the ability to drive to a regional campus or to a university still had access to these courses," said John Wilhelm, principal of Hamilton High School. The program is also free to students, which can drastically cut down on the amount of loans needed for post-secondary education after high school.